There are the usual reasons to go on a bike tour and then there are the reasons you cycle with AfriRoots, a home-grown Tanzanian biking organization with a social conscious. The tour, appropriately named Dar Reality Tour, takes namely tourists, members of the ex-pat community and an increasing number of government officials, through impoverished neighborhoods, and to important local sites and establishments. The tour single-handedly creates pathways between people of different walks-of-life, cultures and even countries. “In the past, I have helped people but mostly financially,” explained Falconnet. “I said to myself that I would prefer to give money by investing it in a project where people can learn to better themselves. “I was impressed by Mejah and the way he cared about the people, offering advice, giving money and time. I was amazed at how connected he was to the community and I felt he could make a change and be the link to the people,” added Falconnet. What resulted was collaboration between Mbuya and Falconnet and the creation of a non-profit organisation, Dar Reality Project(s) intended to address the immediate community needs of the Maumbusho area. 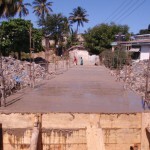 Four projects were identified, the first, the reconstruction of a faulty but vital bridge, already underway after Falconnet literally put his money where his mouth is and contributed $7,000 of his personal funds to support the project. The other projects include the construction of hygienic toilets, the spearheading of a neighborhood cleanup and assistance to coffee merchants, the next stop on the tour and on the agenda of the dynamic duo. Your personal local coffee experience may include a newspaper and plenty of atmosphere, however, for the transplanted community members of the Wagogo Tribe, the local coffee experience includes kashatas, pastries made of flour, peanut and sugar, and a low-quality roasted coffee served under a make-shift shelter. Their goal is to offer their product in the least expensive way to keep expenses low in order to achieve their ultimate goal, survival for themselves and for their families. “I came here to find life,” said John Kusenta, the first to join the coffee operation out of the 7 members, all from the Wagogo Tribe. He arrived in 1998 and his extended family, who are now elderly, were handling the business that he has since inherited. In total, John brings home approximately 150,000 shillings a month (not including expenses), which is equivalent to approximately $125 dollars. Though the tribe members relocated from their home region Dodoma 800 kms away in the belief that opportunities in Dar will eventually lead to a better life. “If we can even get twelve dollars [per day] then it can help because we can send it home to our families,” said Steve Mazengo, who joined the business in 2004. Although each of the members had previous work skills in their region, they had no experience with coffee but are hopeful to improve after having rightly identified a potentially booming coffee niche in Dar, according to coffee expert Alex Ngugi. The group now sells local coffee and delivers to neighbors and area security guards at night. Ironically, a slightly different coffee experience, a happenstance conversation with Mbuya at a local coffee shop where Alex Ngugi is a consultant, launched a friendship and the opportunity for Ngugi to use his skills to help the merchants Mbuya identified. “I went around and saw how they [coffee traders] were living in absolute poverty and this is now my commitment to give back to the community and help them make something of their lives,” said Ngugi. Ngugi, who grew-up around the coffee industry because of his father’s business, went on to get his degree in Baking Technology and has trained in Italy and the Netherlands to hone his craft. He has agreed to become part of the solution for the merchants and create and execute a plan through trainings he plans to conduct.